You’ve implemented various strategies, utilizing DISC methods for sales, leadership, and predictive hiring – but, now what? How do we gage our performance and determine the results of our efforts? How do we use these results to improve our business over time? The answer is simple. We benchmark our performance and continually improve processes, internally, by applying a behavioral selling approach. Measuring our performance, we gain insight into ways that we can optimize all operations and strengthen our efforts by finding our shortfalls and identifying opportunities for improvement. In order to benchmark our performance, we must decide which variables will serve as key performance indicators (KPIs) and how we can use them to analyze our progress, thereafter. Obviously, sales are going to tell everything. If sales are increasing, then we are finding demand. If sales are diminishing, we must be doing something wrong. It seems to be black and white, doesn’t it? But, as you probably already know, nothing is this simple. One question you might have, for example, is how well are we actually doing, and why are we in demand? Using DISC, we might be able to gain a clearer picture and understanding just by identifying the personality traits of our customers. From here, we would decide which members of our team are they talking to and if those members are adapting to each persona in order to better communicate with their customers. Was someone else assigned to this customer before? How effective was their sales strategy, when dealing with this personality type? Using a customer management system (CMS) will help us better track conversations and make note of these factors. They may seem minor, but they may also make all of the difference in the world. Sales are picking up. Now, we’re breaking into new territories, new markets, and dealing with customers we have never dealt with before. Why is that? Did we just launch the holy grail of advertising campaigns, or is it something deeper? Let’s look at our product itself and ask ourselves a few questions. Which personality types find this product irresistible? What is our marketing message? Which statistics and vital information are we offering to potential buyers? Does our message change, based on the niche we are targeting? Are the personality types of decision-makers consistent amongst all buyers? A marketing message that hits on all the facts, explains how the customer will benefit, and how lives will be made better through its use, can make or break sales amongst all personality types. A “C” type personality, for example, will be focused on numbers, certain facts which were determined, and sources cited with this information. A “D” type will be poised on getting more done, faster and more effectively. How will this make his work easier, as he is already wearing multiple hats? We need to look at these elements. We need to break down each niche, the decision-makers, and the marketing message. In full disclosure, these are only basic KPIs and not necessarily determining factors in what has caused an uptick in sales or demand. In teams, are our teams growing? Are we becoming more influential? Finally, are more people trying to work for our organization? We will encounter inquiry from serious buyers, interested parties, and those just looking to find out more information about the product. We need to map out these conversations. We should decide what questions are being asked and who it is that is asking the questions. Which inquiries are leading to sales and which aren’t? We also want to know why they are or aren’t and if the person making such inquiry is actually the decision-maker. We should consider which messages we are putting out to the public and which messages we are disclosing to key personality types. We want to make sure that we are reaching the right people or arming those people, who will then disclose this information to the right people. An executive assistant may reach out to us, for example, on behalf of a “D” type personality. We need to keep the message short and simple so that there is no confusion in the message we are sending and so that the recipient can clearly relay our message to the end-client. A “C” type consultant may reach out, on behalf of a client, and we will want to arm them with facts, statistics, and competitive intelligence data. All in all, we need to be armed with the correct information based on personality type. But, we must also consider these factors when faced with inquiry from our potential buyers. In teams, these are people that aim to go above and beyond. They want to be just as armed as you are when going into any new challenge, environment, or phase in their journey. This point relates to the previous three bullets and will be more complex when we actually break it down. We need to know our sales funnel. We need to know our hiring cycle. Then, we can determine how well our efforts are working. In leadership, we will determine how much stronger our team is becoming, how much more productive they are acting, and how well they are beginning to perform. Is this coming from collaboration, training, ongoing communication, or anything else? What is triggering the conversion, and how does this relate to the DISC of the end-client or team member? And while you’re at it, check out this article on overcoming sales objectives. Finally, is our company, product, or leadership style transforming to meet the needs of the end user, end buyer or incoming team member? How are we transforming, and is this a positive shift for the organization? If we are seeing a positive transformation and becoming more poised on serving our end-buyer or team member, we are closer to gaining long-term loyalty, trust, and overall retention. Are we open to change? Why or why not? Was this a natural progression or were there challenges standing in our way? Our ability to adapt will also be an indicator of whether we are performing well or if our strategy needs to be further tweaked. Benchmarking serves as an amazing tool in the transformation of business, strategies, and ongoing performance improvements. 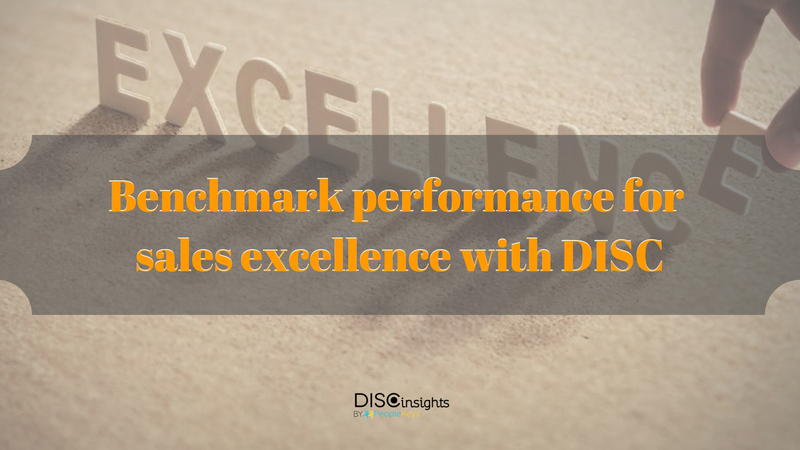 DISC’s implementation into benchmarking strategies will help us to better engage our audiences – whether a new hire, team member, stakeholder, or potential client – and better serve our long-term goals and objectives. It will help us to be better influencers and get to the results we are looking for. Jessica is passionate about “people” and helping them to evolve professionally. Her “I-style” personality trait has led her to 15+ years of service to public relations, social branding, and design strategy. In love with technology, business, and career development, Jessica has contributed to a number of online platforms and is a part of PeopleKeys branding team as well.